From Englesrufer, this Tri-Colour 80cm Chain is the perfect base for a gorgeous Englesrufer pendant or charm. 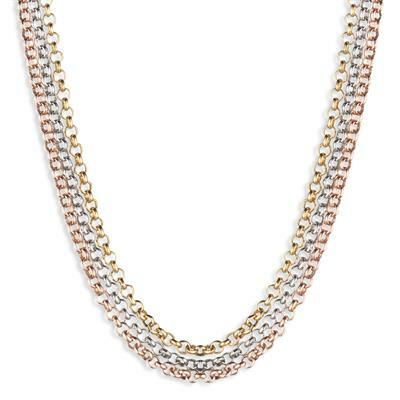 The stunning Englesrufer Tri-Colour Chain is a perfect gift for her, matching perfectly with all outfits due to the sparkling Silver, Gold and Rose Gold coloured chains. The chain is crafted from Sterling Silver and is Gold and Rose Gold ion-plated. The chain features a silver ring infinity double lock.